This is an Olde English personal name from the earliest times in history and probably dating back to the Roman period which ended in 410 AD.. The meaning is obscure but is probably the same as the French "tete", meaning "head" but with reference to a "head-land". The name appears in places such as "Tetbury", meaning "the fort on the hill". The name development has included "tetta" which is pre 1066 Norman Conquest, whilst Ricardus, the son of Tette, appears in the Pipe Rolls of Norfolk in 1166 AD.. The name has always been rare and its "Saxon" origins would not have been popular with the Normans after 1066. 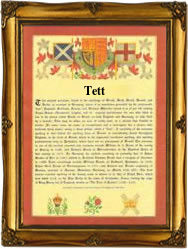 The first recorded spelling of the family name is shown to be that of John Tette. which was dated 1275, The Pipe Rolls of Worcestershire. during the reign of King Edward I, The Hammer of the Scots, 1272 - 1307. Surnames became necessary when governments introduced personal taxation. In England this was known as Poll Tax. Throughout the centuries, surnames in every country have continued to "develop" often leading to astonishing variants of the original spelling.